Includes Multi-mode dip switch panel, Electronic Trigger Frame, Reactive Trigger Response, Adjustable Rate of fire, New-Style Low Pressure Chamber, Expansion Chamber w/ Foregrip, Quick Disconnect Pin, Velocity Adjuster, Bottomline Setup w/ Steel Hose, Vertical Feed, Deluxe Sight Rail w/ Beavertail, 2 Finger Trigger, Elite Drop Forward, and more! 16 oz. Chromolly CO2 cylinder with industry standard Small and compact pin valve. Refillable. Approximately 900 shots per fill. You just have to love the simplicity of this affordable, high quality upgrade barrel. The combination of spiral porting and a muzzle break help to increase accuracy by decreasing turbulence in the barrel as the ball is travelling through and then decreases the wobble as it leaves, heading for its target with unmatched accuracy. 12" 2 piece competition barrel system. New in line expansion chamber w/ foregrip. Vertical ball feed. Bottom line setup w/ steel braided line. 4 firing modes: semi, 3 shot, 6 shot, full auto. Includes 9.6v rechargeable battery & Rapid charger. 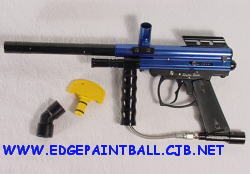 include: VizionTM Custom Receiver with Airflow Vents, Premium Custom Color Anodizing, Removable Gas-through Fore Grip with Mini Expansion Chamber, Built-in Regulator with Gauge, Slim Double Trigger, ZebraTM Rear-cocking Bolt, Low Pressure Chamber, Quick Disconnect Pin, Dual Function System (DFS), Deluxe Sight Rail with Beaver Tail, Air Maximizer Valve, Semi-auto Action, Tournament Velocity Adjuster, Drop Forward, Power Feed, 45 Grip, Metallic-finished Trigger Frame, Super-light Trigger Pull, Anti-double Feed, Micro-polished, Aerospace Aluminum Barrel with Muzzle Brake, Bottom Line Set Up with Micro Line Hose, Shroud. This Is A Super Buy And The Lowest Price This Gun Has Ever Sold For EVER ! The VL Revolution is the flagship of the ViewLoader line. This 200 count patented electronic agitator loader with spring loaded flip cap has set the industry standard on the tournament field. Designed for the serious tournament player, the VL Revolution is fastest feeding loader on the market today. This loader incorporates a 12V power agitating system and improved paddle design that provides a much quicker response time and unmatched feed rate. This is the loader to use if you need the ultimate in performance. 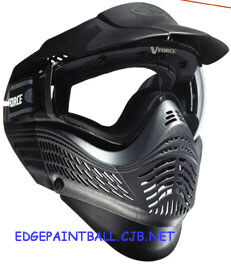 It is equipped with an internal anti-jam mechanism that agitates the paintballs when the feed neck becomes empty. The VL Revolution’s four blade propeller will feed 10-12 balls per second. Two 9V batteries are required. Batteries not included! 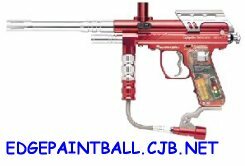 The Kingman Spyder Sonix paintball marker features a 45 grip with a rubber cover, a fore grip and a double trigger for easy handling and firing. It includes a second generation venturi bolt and an external velocity adapter. gas thru fore grip with bottom line and low pressure tube. Comes in Plain white oem box. Comes with rechargeable battery and wall charger. This Gun Well Get You To The Winner Circle And Keep You There ! 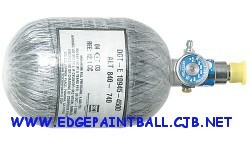 16oz aluminum Co2 Tank with industry standard pin valve. Refillable. Approximately 800 shots per fill. Tank O-ring (included). Whether you play day or night, recball, scenarios, or local tourneys, Vforce Shield offers unmatched protection, vision, lasting clarity and stunning looks. Sperical lens for maximum peripheral vision and total visual clarity. Patented Quick-Change lens replacement system Low profile rigid armor with hinged throat guard Clear-Vision Thermocured Anti-fog Lens for hard play, all day, all night Durable scratch resistant Thermocured hardcoat High-density foam for superior fit and comfort Zero-slip silicone Pro-Strap, flexible visor and soft carry bag Superb fit, even over glasses! The 9 volt VL Revolution's two blade propeller will feed 6-8 balls per second. One 9V battery is required (not included). Available in Diamond Clear. A 200 round loader with motorized agitator, 9 volt battery to power two blades. 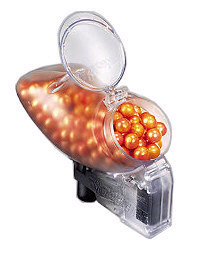 This feeder kicks into gear when your paintballs are failing to feed. Eliminate dry firing. is sleek, sporty, affordable, and is capable of challenging any opponent. 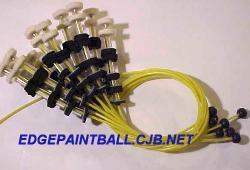 Black Max performance paintball marker kit. 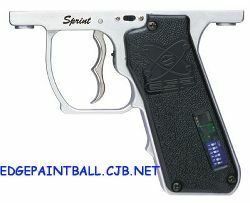 Includes Black Max Semi auto marker.Semi-automatic. 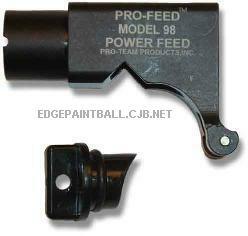 .68 caliber with interchangeable threaded aluminum quick change barrel. Powered by CO2. Corrosion- resistant aerospace polymer. Disassembly and cleaning without tools. Flush cocking system. Rotating safety lock lever. Double trigger. Trigger speed is 10 plus shots per second. Length 17.5". Weight 1lb. 7oz. Also includes PMI x-ray goggle, PMI elbow, cable power wipe squeegee, 200 round hopper, and PMI barrel plug. Don't for get a Co2 Tank ! IT'S HERE! BE THE FIRST TO OWN ONE! THIS IS A NEW RED IMAGINE SELECT! The Kingman Aggressor XT paintball marker provides performance in the field with a semi-automatic action and a .45 grip with a double trigger. The sleek design includes a rear cocking, 2nd Generation Venturi bolt, a bottom-line set-up with a steel hose and a sight mount with a Beaver tail. Package Includes: Marker,Java X Type Mask System, 12oz Tank, 200 Loader w/elbow, o-rings, factory parts kit, Everything you need to light your opponet up. 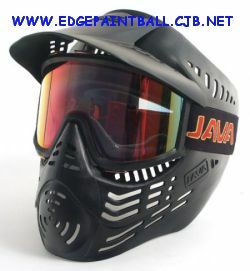 JAVA goggles offer sleek styling and full protection at an affordable price. With premium features such as anti-fog coating, dual-density foam, and mirror-finished thermal lenses, you can be assured of getting the maximum value for your money. With its sleek styling and unrivaled performance, the AMG Electronic Paintball Gun will shock your senses and take your game to the Extreme. Rule the field with the AMG E-marker. 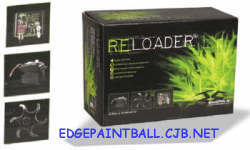 STANDARD FEATURES:* Firing modes include semi, 3 burst, 6 burst, and full auto. * Smooth In-line expansion chamber. * Regulator with mini gauge. 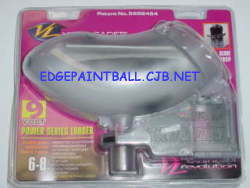 * Aluminum 2-finger trigger with secondary safety. * AMG Deluxe drop forward. * Classic 2-in-1 trio barrel. * New anti-double feed . Comes With Charger And 9.6 V Batterry And Dlx Hard Carrying Gun Case For FREE ! New from Kingman! 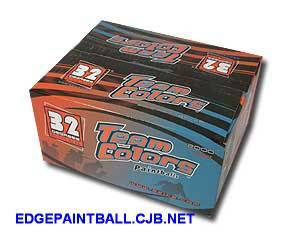 This Spyder Super Kit contains everything you need to get going in paintball. It's the perfect gift for any occasion. 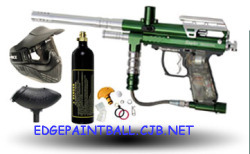 Kit includes a Spyder Compact 2-in-1 Paintball Gun, JAVA X-type goggles, JAVA 200-round loader, JAVA 12-ounce CO2 tank, JAVA Jerk squeegee, two JAVA 140-round Speed tubes color may vary , and spare parts kit. Length with barrel: 17 inches. Weight: 1.8 pounds. FITS: Shutter, TL/TL Plus, XTRA, JAVA, Compact 2000, Compact Deluxe, and Compact 2n1.